Exploring spirituality in a post christian world. How do we describe and explore spiritual experience? Without orthodoxy, what is the basis for life's meaning? What new myths are being created to convey new spiritual experiences? How does this relate to everyday life and the world around us? Are there beliefs that can cause harm? "The human body stores immense amounts of light: The 100 trillion atoms in each of our 100 trillion cells together store at least 10 to the 28th power photons. This is enough light to illuminate a baseball field for three hours with 1 million watts of floodlights." One thing that brings wonder to me is how close the ancients came to entering into our age of knowlege long before the 20th century. 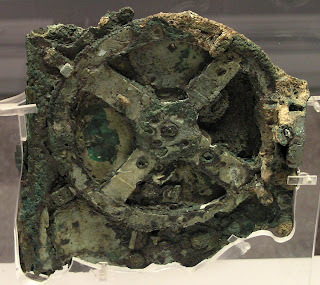 One exmple of this, is the discovery, some time before Easter, in the year 1900 of what is called the Antikythera mechanism This device was found off the Greek island of Antikythera in a 2200 year old ship wreck. It was a device of such complexity that before its discovery devices like this would not have shown up until 1400 years later in the Middle ages. The Antikythera Mechanism Research Project, led by Tony Freeth, have used various imaging processes to begin reconstructing this device. It has approximately 30 gears that have between 15 and 223 triangular teeth. In this schematic you can see the complexity of this ancient astronomical analog computer. This team has recently used some innovative lighting techniques and 3-D X-ray computerized tomography to read some 2,160 greek letters that had previously been hidden. These contained markers and instructions on how to use the device. 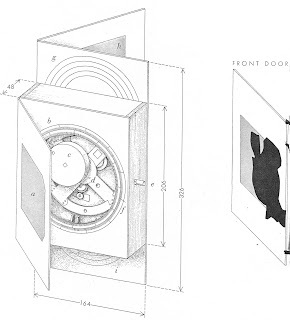 The device was probably contained in a wooden box and had a small hand crank to opperate it. It has become apparent that whoever constructed it was using calendrical and eclipse functions from Babylonian astronomy that had been absorbed into Greek astronomy by that time. It contained gears that represented the theory of the astronomer Hipparchus, who explained the moon's irregular movement across the sky by identifying its elliptical orbit. There have been a number of reconstructions of what the device might have looked like. The Antikythera Mechanism Research Project is currently building a computer animated model to study what it may have been used for and compare it to the positions of the stars, planets, moon, and sun in the year 100 B.C. "The origins of the mechanism are unclear, as are the circumstances by which it came to be on the cargo ship. The ship was Roman, but there is no doubt that the mechanism itself was made in Greece. One hypothesis is that the device was constructed at an academy founded by the ancient Stoic philosopher Posidonius on the Greek island of Rhodes, which at the time was known as a centre of astronomy and mechanical engineering. Investigators have suggested that the ship could have been carrying it to Rome, together with other treasure looted from the island to support a triumphal parade being staged by Julius Caesar." Other engineering mechanisms from the Greeks included the hydraulis or water organ. You can view and hear how it sounds in this modern reconstruction based on one found at Greek city of Dion, at the foot of Mt. Olympus. 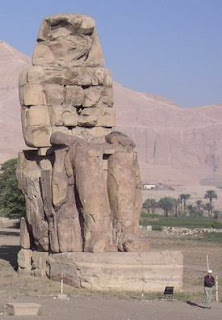 A water powered sound mechanism was used to create the awe inspiring voice of Memnon's statue at Thebes. "Solar heat was used to syphon water from one closed tank into another, thereby producing compressed air for sounding the pipes." In all of these we have but glimpses of ancient technology that, until the 19th and 20th century, didn't move much past individual achievements. Many were connected with religious practices and were seen as magical or physical representations of the spiritual. "I used to envy the father of our race, dwelling as he did in contact with the new-made field and plants of Eden; but I do so no more, because I have discovered that I also live in "creations dawn." The morning stars still sing together, and the world not yet half made becomes more beautiful every day." The word salvation comes up in spiritual dialog quite often. What is interesting is we often convert that to saved, as in lifting someone out of the clutches of danger like a superhero would do. The root word in salvation is actually salve, which refers to a healing balm or lotion. In one image we have superman flying down and saving someone from harm, in the other we have someone offering or applying a healing balm to someone else in the pain of disease. I remember finding Batman far more interesting than Superman. Batman did his "good" deeds in secret and anonymously, where as superman was very public, even though he had his humble side as Clark Kent. Batman had wealth and non superhuman athletic abilities that his passion for justice honed and he had his, not so humble, public persona millionaire Bruce Wayne. Superman was born both super strong and super good. He was Jesus like, except he was indestructible in a physical sense, but was vulnerable often because of his own "goodness." For example, he would come to save someone even though he knew he might die from exposure to kryptonite. Each of the hero saviors had their own motivations for saving others. Batman came from loneliness and anger. Superman came from loneliness and empathy. Each isolated by their own "greatness" and by their own pain. If we look to a salve or healing lotion, there is no hero. If there is a hero, its the salve itself. It takes no super human ability to give someone the healing lotion or to apply it. An individual can't apply salve to hundreds of people at the same time. (After I wrote that last sentence I had this vision of some guy with a fire hose filled with lotion. Somehow I think something would be lost in fire hose balm application.) It is most likely a person to person experience, or its something a person can apply to themselves after being given it. It is not an isolating experience, its a process that requires at least two people to be involved. In fact the healing might not be in the balm alone, but may require someone to touch. I'm a fellow traveler navigating my way with great curiosity.